This is something that has bothered me for a while. It sort of relates to Mario. Why, when referring to Japanese people, are they sometimes given the suffix "-san?" Such as Miyamoto-san, Sakaguchi-san, Uematsu-san, and so on. What's with that? J.J.: "San" is just the Japanese equivalent of the western prefixes "Mr." and "Mrs."
When did yoshi first appear? I thought we first saw him in mario world on the SNES, but since them i've seen him in loads of NES games that must predate it. J.J.: Super Mario World was the first game with Yoshi in it. After the SNES was released, Nintendo continued to make games for the NES. Hence, Yoshi appeared in some NES games that were released after SMW. Hi, I don't know what I'm doing wrong. I've beaten the whole game, for Super Mario All Stars + Super Mario World. It says I've gotten 93 Goals, but there's nothing else to beat..Am I missing something? J.J.: This can be one of the most impossible questions in the world to answer. My only advice would be to finish each level in Star World the "wrong" way and replay some of the multiple exit levels in Forest of Illusion. I was just wondering... you remember back in 1996, around the time that Mario RPG was released, Squaresoft left Nintendo. Does anyone know why Square left Nintendo? I don't remember, and I was hoping that someone else would know. Thanks!! J.J.: Squaresoft staffers complained that their unique culture and traditions were being largely ignored by the predominantly anglo Nintendo employees. In 1994, Squaresoft elected a fiery separatist Premier. The Premier promised that within a year, a referendum would be held, giving Square employees the chance to decide if they wanted to separate from Nintendo. The Prime Minister of Nintendo pleaded for Square to stay, and promised his administration would be willing to grant Square "distinct society" or "sovereign-association" status in return. The PM's pleas fell on deaf ears, however. In 1996 the referendum was unanimously passed, and Square finally separated from the Confederation of Nintendo, and became its own company. I would like to point out that there is no reference (so far) to Balloon Kid in Super Smash Bros. Melee. The character you are referring to is the unnamed lead character in NES game, Balloon Fight (referred to in the manual as a Balloon Fighter). The "Balloon Kid" is called Alice, and she hasn't yet appeared. Additionally, I have information on all characters who have appeared so far in the trophy mode up on my website. Deezer helped out a lot with some of the really obscure ones, such as Tamagon and Kitsu Ayumi. This should settle any arguments as to what they're all from. J.J.: Normally, I hate to give anyone free links in the mailbag, but I found this person's site to be surprisingly informative. Check it out! Hey, if you guys ever get tired of classicgaming.com, you could always try to register www.themushroomkingdom.com, because it hasn't been by anybody yet. And a question, which Final Fantasy game is Culex from, if any? J.J.: www.themushroomkingdom.com HAS in fact already been registered. So has mushroomkingdom.com, tmk.com, and just about every other good domain name. Culex is not from any Final Fantasy game. He is just a generic, FF-ish character. J.J.: (singing:) No! No! No no no no no no no! How come when you get Board Bowser's Sub the first time, you can never seem to do it again? Even when you select "Board Bowser's Sub" off the Star Select screen, the submarine will never be there. Is it possiple to get on Bowser's Sub again? OK, this one is really bugging me! In Super Mario RPG, sometimes I will encounter a golden shy guy during a battle in the pipe vault. He will immediatly run away, before anyone can attack. I dont even know his real name! He runs away first thing! I kept using earliertimes but he runs every time. What i really want to see is his psychopath message. It has to be something funny, like "I hate George Bush..."
J.J.: That feisty scamp is known as the "Shy Ranger". The only way to fight him is to equip the feather, which you get from Dodo in Nimbus Land. He's a pretty average enemy, nothing special. His psychopath quote isn't even that witty. "Transmitting information, over and out." A bit of an anti-climax, eh? I have a few questions about the shy guys. 1. 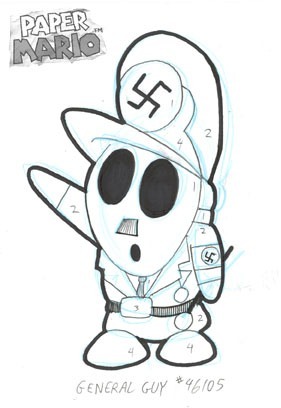 How come the white shy guys look like they belong to the Ku Klux Klan? 2. If you've seen this picture that's been in Nintendo power a couple of times. It has General Guy in his car with two shy guys in front of of it. Well that makes him look like Hitler and two nazis hailing him. 3. Not really a question but I think that shy guys are the most intelligent bad guys in the Mario world because they fight in groups and they have the best weapons. 1. Because they obviously do. 3. More intelligent than Wigglers? I think not! In correspondance to the wise fellow to said that the 'Yoshi' pronunciation in the Mailbag was wrong was right. It's Yoh-shi, not Yoe-shi. Only the Americans pronounce 'Yoshi' wrong. In the Japanese, French and German voice-overs in my two copies of Smash Bros, it's Yoh-shi. Also, in Yoshi's Story, the Yoshis themselves pronounce Yoshi Yoh-shi. Even the American advert for Yoshi's Story (it's Yoh-shi again). Finally, 'Boshi', a pun on Yoshi, is pronounced Boh-shi, so how can Yoshi be different?! So be diplomatic, and admit that (although Yoe-shi is the common pronunciation in the USA and throughout the Hoskins movie) Yoshi is pronounced Yoh-shi. The Japanese language is made up of many different characters, each with a unique sound. The name "Yoshi" is made up of two characters, one representing the "Yo" sound, and the other representing the "Shi" sound. There is no "Yoh" or "Yaw" sound in the Japanese language, so the name cannot be pronounced the way you mentioned. There, do you get it now? 1) Have you ever noticed how even though it seems Gamecube's right there they don't release it to make us be itching for getting it? 2) What abilities do you think the Ice Climbers/Bowser will have? ICs could only use that huge hammer, and Bowser only jumps around and spits fire. 3) Speaking about Bowser. Have you noticed how he's being mistreated lately? Acting like kiddie villain that only steals coins, playing karts and tennis with the enemies that stomp him everytime? That's evil, no? 5) This isn't a question. It's another silly cameo, so get ready: In Zelda: Majora's Maskie, there's a Zora that plays SMB3's Underwater level theme. I just couldn't resist adding a cameo! J.J.: 1) Yes, I have noticed that. 3) Yah, Bowser doesn't go on nearly enough bloody killing sprees. 4) The man is obviously a pathological liar. 5) Finally, a GOOD cameo. We'll add it to the page ASAP. Not that this has anything to do with Mario, but since you know about Japan I wanted to ask you if you knew why they make the cartoons and mangas so sexually explicit. J.J.: When you work 27 hours a day like most Japanese men, your mind begins to wander, and you eventually develop weird fetishes. Most Anime is simply designed to satisfy the fetishes of lonely Japanese businessmen, who have not seen their wives since the Tanaka Administration.